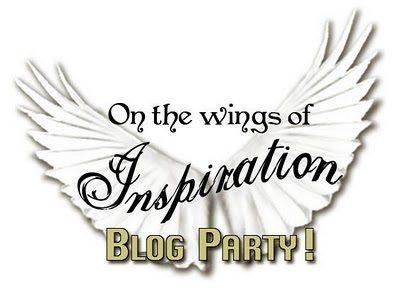 This week the Inspiration Avenue Challenge theme was Owls... Owls!!! Now on doing and image search on line it would appear there are people out there who believe that owls are gentle cute creatures, who would make sweet little drawings and things.... but I have to be up front and say that owls freak the living daylights out of me. They are not cute, they have talons and stare like nothing else, and they eat all sorts of little critters and they just hang there looking all silent and knowing. Some people hate clowns, but for me it is owls. Clowns are funny, they make balloon animals, and yes Stephen King wrote It about them and cashed in on people's clown phobias, but I think they get a bad rap. Twenty clowns in a mini is hilarious, whereas twenty owls in a car... that is a Hitchcock plot just waiting to happen! Owls must have a much better PR firm than clowns because somehow people don't seem to see the evil lurking there, people draw and paint them in a cute and harmless way, and they adorn pencil cases and cards and notepads. I swear if I got a card with an owl on it, no matter how cute, and no matter how much I had previously liked the person giving it, I would be thinking twice about any future dealings with that person! So the moral is I have spent a very stressful few days facing yet another nemesis - Inspiration Avenue will challenge you in ways you never imagined it turns out!!! 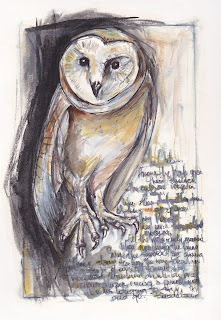 I drew and painted the above work from a picture, because there is no way I could face the real thing, and managed to find a poem by Baudelaire which acknowledged the creepy nature of owls, so I worked that in as well. There is a man who knows what the story is. I feel strong and brave having faced it and come out the other side, and I know I will be facing them all weekend long as I visit all the other blogs and see what everyone has created, most of whom were probably thrilled when they saw the topic and have created lovely images... that will still freak me out! think what a service they do, getting rid of mice and other nasties. Clowns on the other hand are evil beasties hiding behind all that makeup!! Even if you don't like them, I love your owl picture. I would say you did a fantastic job with your fear of owls. This is one stunning painting/sketch. Although I didn't freak out over the owl, it is not something I would normally consider for my art. Love yours, though. Does this mean we can't be friends because my entry is a "cute" owl? I hope not! But I do think I am more afraid of them than I thought after reading your post, LOL! even if the real thing scares you, you still managed to make a wonderful piece. i love the way you incorporated the text into your work. i love it! Owls scare me too maybe it is their wisdom that does it. Fantastic drawing though! Like them or not, this owl looks great! It's funny how we all fear different things. For our family owls have special meaning. My mother and father used to see owls all the time and after my dad passed away my mother has found comfort in them when she sees them now. Clowns, now they freak me out! love your drawing!!! and I hate to say, I think I like owls more than clowns, sorry, sorry sorry! the clowns, they seem so genuinely pleased. Too funny! I do know what you mean though because we had a pair of owls living in the trees out back in Tampa, FL. My hubby worked nights at the time and they would fly around and hoot and kind of freak me out...but in an exciting way. Now...alligators...they're the ones that scare the beyouknowwhat out of me. Be brave! Awesome idea Tracey! Thanks. I lived with 5 other people WAY back when and we painted cardboard egg cartons black...sprayed with glitter and put a little piece of broken mirror on each tip and glued them to the ceiling. It was Verry cool and when you said that about the circles hanging from the ceiling...that's what came to mind. :) Thanks for the blast from the past! Oh Trace, I love owls (can we still be friend's? 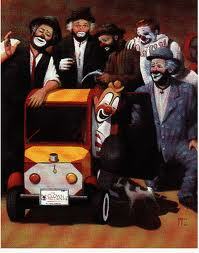 )& I love clowns & I love your painting. It is so expressive. You are so talented. That's a nice piece Tracey, even though you dislike owls. You are brave. I don't like snakes. I can't even look at pictures, so I won't ever consider drawing them. I love owls but know they are birds of prey, and that's a good thing for us. You did a wonderful job, I have never seen such a great sketch/painting. As for clowns, I have a friend who went to clown school and she is just so lovely that I love clowns now more than ever. So, I guess it's all perspective. Beautiful piece! Your work is wonderful! Thanks so much for visiting my blog! Your owl came out fabulous despite your fears! I thought your post was great. Thanks for making me smile. For me...it's clowns! I think clowns are evil. Why would someone have to disguise themselves to make a child smile? They wear all sorts of mismatched clothing and have enormous feet which is horrible in itself. Then you can't see their eyes for all that makeup! You never know who the real person is under all that garb, although 99% are great people. But an owl, is just a bird waiting for some dinner and you know what he is. Great image! I love the effect you achieved with the bordering. You've a wonderful talent and the piece you made is intense. Thanks for your comment on my post and after reading your previous post about changes in the house, Matt is not so ordinary! Hope you find the perfect pieces to complete the rooms. Well, scared or not, that's a fantastic picture of an owl. I would go on to say how lifelike it is but don't want to freak you out... Oops!! It is a really fantastic piece. Love it! You must have really worked through your fear because your owl is fabulous. I am a pro-owl, anti-clown girl & your post made me giggle. It is so true the perception of owls - super cute & sweet. :) But I still love them. I REALLY love this- scared or not, you've made such a beautiful owl! Oh, sorry I didn't have this in the IA post, there were two Traceys in a row, and even though I double checked to make sure I'd gotten your in, I missed it! It is in there now, tho'. Well, I'm a big fan of owls espceially since last spring when I came up really close with them, but on my blog you will see that I have not created a cute owl - just on the contrary. Hm, but your owl looks rather cute... How come? Great work, by the way, I really like it. Owls happen to be very popular and I do like them too. Where we used to live we had so many gophers which ate everything that was planted and I read that a nesting pair of owls can eat up to 1200 rodents in a season, so they have their place in keeping nature in balance. I like how you have encorporated a poem with your owl and featured his feet which he carries his prey off with. Such wonderful rendering of something you're fear of. Bravo! Well Done! You did a a lovely drawing of the owl. I have to admit I like them more than clowns. You should be a lawyer! I am (almost) convinced that I like clowns, lol. LOL, well your owl is fantastic, even if they do creep you out. I think owls are interesting. Not exactly cute and cuddly but very interesting. And they keep the rodents down. I don't hate clowns, either. They aren't as useful as owls, though. I'd rather have an owl living in my barn than a clown but I probably wouldn't turn the clown out, either. :D Excellent painting! Good for you for painting your fears! I think he's beautiful.